Despite the comparisons and similarities to Lost, the writers intend them to be very different shows. 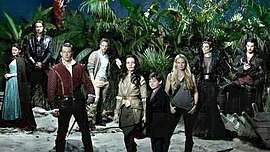 To them, Lost concerned itself with redemption, while Once Upon a Time is about "hope". Lost co-creator Damon Lindelof aids in the development of the series as a consultant, but has no official credit on the show. Kitsis and Horowitz have called him a "godfather" to the series. To differentiate the storytelling from what the audience already knew, the writing staff decided to begin the pilot with the end of the typical Snow White fairytale. Themes concerning family and motherhood were emphasized, in contrast to the focus on fatherhood in Lost. Kitsis and Horowitz sought to write strong female characters, rather than the classic damsel in distress. Horowitz stated their desire to approach each character the same way, asking themselves, "How do we make these icons real, make them relatable?" This page was last edited on 15 April 2019, at 05:18 (UTC).